I got an email from a reader recently! Asking for my opinion regarding her teenaged daughter. First of all, I am honored that anybody would ask my opinion on ANYthing. Let me say that I am not a big expert at this – far from it -(just read my posts from January!!) but I do have some thoughts about most things and am glad to share what I’m thinking. So that’s just it… my opinion. Here’s the question. Q: I have a 16-year-old daughter who would like to lose weight but doesn’t get a lot of exercise. I think she would die rather than go to a WW meeting. We already tend to keep healthy foods around the house, and she makes fairly good food choices compared to a lot of American teenagers. But without tracking her eating, and without a lot of exercise, she doesn’t lose weight. Any suggestions for how to help a teen in this kind of situation? Well, I’ve been mulling this over for a few days now. It’s a big answer! A long answer. With many facets and layers. Without writing an entire BOOK on the subject, here are my thoughts. Motivation: This is one of the biggest factors in being able to lose weight, I believe. Mathematically, I think that M (motivation) must > All Those Factors Conspiring Against Weight Loss (love of foods, emotions, environment, inertia, etc) or else it can’t work. And to be honest, I did not find sufficient M in my life until I was 49 years old. (do not use me as an example! just sayin!) My motivation was Health, pure and simple. And until I found that particular motivation, my M was ALWAYS < All Those Factors. When I was 16, being motivated by health was the LAST THING on my mind. Hell, it was the last thing on my mind when I was 40. I just felt like I could do Whatever for However Long, and it would not catch up with me. SO is it hopeless? NO. You just need to help this 16 yr old figure out her OWN motivations, which can be similarly compelling, just different. They are much more likely to be socially based, like, “I want to feel comfortable in a bathing suit.” “I want to be able to look good in any outfit at Urban Outfitters.” “I want to feel HOT.” (or whatever) One of the best tools for this is the Beck Diet Solution, which helped me a LOT at the start of my journey. It is all about tapping into one’s own particular Motivation and keeping that front-and-center at all times. Because it is SO easy to just Not Care. The other thing is to separate Her desire to lose weight, from Your desire to have her lose weight (because you know she will be happier and healthier). For many many years, I could not FIND my own desire/motivation because it was clouded and all tangled up by what I PERCEIVED to be my spouse’s desire for me to lose weight. And I rebelled against this big-time. For YEARS. I couldn’t focus on what I wanted to do because I thought I was doing it for HIM, and that was a major losing proposition all the way around. It upset me and made me want to eat more. Which I did. So you have to take a deep breath and let her know that it’s HER choice/decision etc and not yours, even though you are there to support her. HOW to do it? I do not know if tracking is the answer for a 16 y old, although it might be intriguing for her, just on a curiosity level. To just lay it out mathematically, pure and simple. Once she’s decided that she is motivated, it’s just a matter of math. Calories in have to < Calories out. Part of losing weight means being more conscious and knowing what you are doing in that regard. I wonder if she would like having something like a Body Bugg, which measures calorie output. (I want one sooooooooooooo bad!!!!!! Santa please!) You know that people constantly underestimate the # of calories they eat (why tracking is so useful!) and overestimate their calories burned. So it’s a great reality check tool. It might be interesting for her to just try tracking food FOR ONE DAY. Just to see. Just to understand WHY her body might be hanging on to some weight. It could be illuminating. But you are RIGHT about not bugging her or being the bad-guy Tracking Police, because that will blow up in your face faster than you can say deep-dish pizza with extra cheese. She’s gotta find her own method. She needs to find some form of activity that she considers Fun. Again, doing it with a Buddy is going to make ALL the difference. I think having something like a pedometer (measuring steps per day, and doing a mini-competition? With prizes??? :-)) or a Body Bugg would be fabulous. 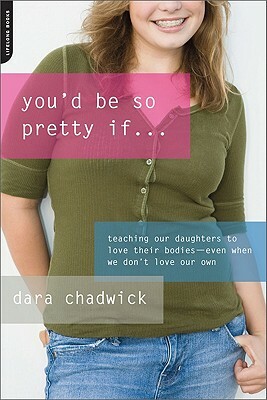 Lastly: Dara Chadwick blogs about girls, moms, weight and self-esteem. She’s written this great book. I bet she’d be able to give you even more informed and useful advice. I think you are an AWESOME mom for your concern and wanting to support your kid in this way. It’s fantastic that she already has your support and that you already have healthy food around. The biggest thing is to gently guide her in choosing her OWN path that she wants to take. Those are my two cents for the moment but I really hope that lots of readers will chime in with comments. Help me out, folks! Without knowing the girl, it’s hard to formulate a real opinion…But I was a teen about 10 years ago so I remember what it feels like, and I think it’s really important to remember that e-v-e-r-y-t-h-i-n-g is a big deal right now so treading lightly will be the best idea. WW e-tools helps me a lot though I think the meetings are even more helpful. But tracking would be a big start. Just like all of us, she has to want it. If she does, she’ll show an interest. If not, don’t harp on it because it will just cause resentment. Just saying. What a tough subject to tackle, but I think you’ve made a lot of great points. The big problem I see with giving people weight-loss advice in general is that it’s very easy to arm people with information and opinions, but if they don’t want to make the change, it will never happen. Or, even better, if they are not being honest with themselves, they can’t improve their health. Just the way the mother worded her email leads me to believe there’s a lot of enabling and denial going on. As far as the step go, why should an overweight 16 year old not have to track her calories? Tracking calories is important not only because it allows you to monitor your calories, but it’s also very educational. We as individuals need to be in control of what we eat, not rely on outside influences to help us make good choices. Sometimes the best way to do this is to calorie count — not to become a slave to the numbers — but to get back to basics with food. So many of us have lost touch with reality when it comes to food that we first need to repair our relationship with it and learn more about it — two things that will create positive lasting changes. It might be helpful for the girl to keep a running log of what she eats in a typical week. She doesn’t have to count calories whole doing this, but it would provide a nice basis of comparison. Making ‘fairly good food choices’ doesn’t sound too convincing to me. Also, if the mother is on WW, then her idea of a ‘fairly good food choices’ may not be in line with reality. I would also suggest that she exercise. The mother says she does not exercise and thus, cannot lose weight. I know plenty of people who have lost weight without exercising (they’ve also gained most of their weight back and then some). Breaking bad habits like eating poorly is much, much, much harder then creating new habits like exercising. I wonder why this girl cannot exercise. Exercise is VITAL to your health. Yes, you can lose weight without doing it, but losing weight and being thin doesn’t mean you’re HEALTHY. Exercise is the best preventative medicine out there. She needs to exercise — even if it’s five minutes a day to begin with. It seems that the mom is also trying to lose weight. Can they make it a team-effort? Exercise together? Share books together (like the one you suggested)? Weight-loss is a deeply personal and individualized journey, but there are endless weight-loss related activities they can do together! I agree that exercise is key, but the key is finding something that is pleasurable. I have two teen daughters myself and I think both of them would have rather died than do any sort of “team effort” exercise with ME. They had to find their own paths, and still do. And I agree. It’s not going to happen unless they want to, period. It may happen soon, but it may not happen for years. Encourage activity. She’s on a team, we play b-ball in the driveway and kickball for fun. They see me go to the Y and work out with weights. Provide healthy foods AND regular meals as much as possible– I think this is key among the highly svelte French, they always know they have a good meal coming at regular intervals. They don’t work through lunch or stuff their faces in the car because they didn’t get breakfast. Focus on eating real food and staying active. As far as counting or measuring to lose weight, I agree that the motivation has to come from the girl and not the mom. Overweight is so much more common these days than it used to be. Teens are all about control and getting too involved just feels like tempting an eating disorder to me. All sympathy to the mom in question. It is NOT easy. I agree with a lot of what has been said here. As a professional coach who also lost over 70 lbs and kept that weight off for 9+ years, I can tell you that this is definitely the place to tread lightly. So many eating disorders start at this time in a person’s life. And, hate to say it, many start with parents’ interference. I’ve had quite a few situations where moms drag their daughters to see me, wanting me to “fix them” or “help them.” It’s usually the mom who needs help with her own expression of love for both herself and her daughter. Many of my clients’ diet obsessions started with their mother’s or father’s disapproval. I have even had clients whose moms made them weigh every day and packed their lunch according to whether they gained weight yesterday or not! (Forget that the scale can’t measure fat loss and water amounts fluctuate wildly in the female body day-to-day, that’s another whole story.) Some people are obsessed with the number on the scale and use it as a way to judge themselves and others. What this girl needs is love and acceptance and a healthy parent. If parents exhibit good boundaries around the use of food (not rigid, not lax, just firm and clear), kids will pick up on that. They will see that mom doesn’t veg out in front of the tv with a pint of ice cream – that’s not acceptable. They’ll see that dad doesn’t throw back 4 beers when he’s angry, he talks about it instead. They’ll also get the message that they are loved and lovable, no matter their size, shape or appearance, if that’s exhibited. Kids (and adults for that matter) don’t need more rules about food, they need self-esteem and they need to value themselves too much to abuse their bodies with excess. A good book for all moms to read is “The Six Pillars of Self-Esteem” by Nathaniel Branden. Obviously, I’ve been working with these issues in my own life and with clients for ages… I could go on and on. I’m hoping for love and respect for both mom and daughter. A parent’s biggest job is to teach their kids self-love. As one of my clients said to her 10-year-old who wanted to go on a diet: “It’s perfectly ok to love yourself AND prefer to be a different size. But let’s concentrate on the love part and how beautiful you are.” Now that’s a lucky daughter. Please, please listen to Pat Barone. First of all, is the young lady honestly and truly obese (“a few pounds overweight” should NOT be an issue at this age even though girls think it is)? I’m not just talking BMI > 30 here, I’m also talking body fat percentage and muscle mass. If she’s not obese, don’t even ADDRESS the idea of losing weight, unless you observe changes in her eating patterns. If her eating patterns change and/or she starts losing weight, PAY ATTENTION. It is typical for teens to crash diet in the most unhealthy ways imaginable. Not only does this set them up for disordered eating and eating disorders, but even short periods of crash dieting can set them up for all of the metabolic-syndrome-related diseases of adulthood. It sets up the pattern and acceptability of yo-yo dieting (probably better called “ratchet dieting”). Also… please don’t even MENTION WW or you dieting to your teen. It sets up unhealthy expectations that you wish her to be constantly dieting, being constantly on the weight-loss wagon, etc. — which teens interpret as meaning “model slim” (which is unhealthy, even for most models). AFAIAC, dieting per se is one of the worst examples you can set for a teenager. Weight loss programs and teens mix about as well as alcohol and teens — they are just not able to do it in moderation and their sense of self may be changed forever by the experience. I think Mom here needs to stop worrying about a teen who is not obese or diabetic and is eating healthily. Putting yourself in the position of weight-loss coach or personal trainer could do lasting harm to an otherwise nurturing and supportive relationship. Being a good example of eating healthy foods in moderation, exercising regularly (in fun ways) and saying complimentary things about herself AND her daughter, will do more for her daughter in the long run.